Stock your library with 9 best-selling Oracle apps, crafted with love by Alana Fairchild. Alana is the hottest rising star in the intuitive world. The honest, powerful guidance Alana's apps provide have changed the lives of thousands. Save when you buy a bundle. 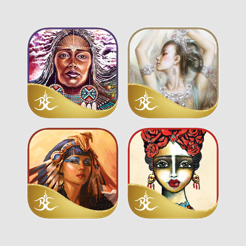 You probably know that price will adjust based on how many apps you already may own that included in the bundle and this is the best price we've ever offered on these incredible Oracle Card apps. Hurry and get your bundle because this offer won't last!